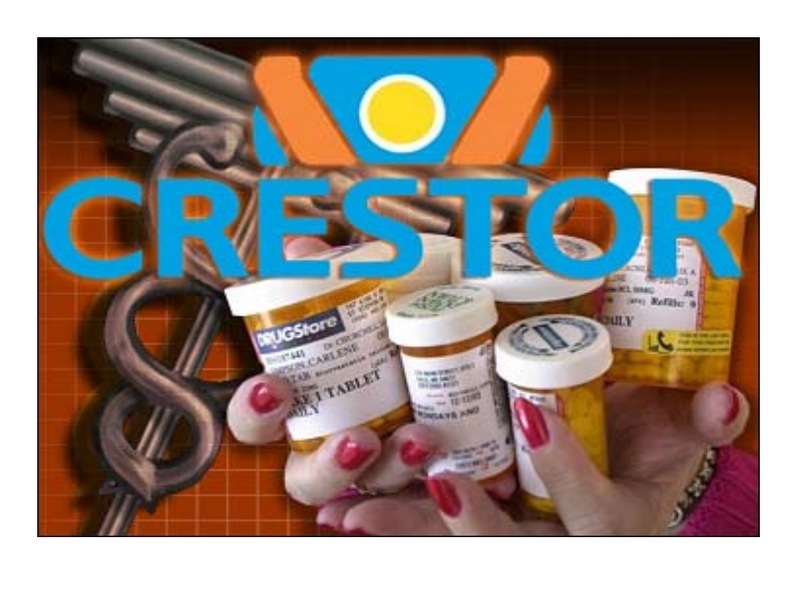 According to the New York Times and the Wall Street Journal and Fox News and the AP and so on and so on, Crestor is the best thing to happen to mankind since, well, hmm let’s see….oh yeah, I got it, it’s the best thing to happen since Lipitor!!! .Yay, Big Pharma to the rescue. We are going to live forever. We all know that the marketing of a new drug sometimes involves stretching the truth. So let’s try and make some sense out of what they are saying. AstraZeneca PLC’s cholesterol drug Crestor sharply lowered risk of heart attacks among apparently healthy patients in a major study that challenges longstanding heart-disease prevention strategies. The findings could substantially broaden the market for statins, the world’s best-selling class of medicines. Heart experts said the findings, presented Sunday at the annual scientific meeting of the American Heart Association in New Orleans, could reshape cholesterol-treatment guidelines used for more than a decade to fight cardiovascular disease, the world’s leading killer. They also could help AstraZeneca boost its 9% share of the global cholesterol-drug market, which exceeds $15 billion and is now dominated by generic statins and by Pfizer Inc.’s Lipitor. People with low cholesterol and no big risk for heart disease had dramatically lower rates of heart attacks, death and stroke if they took the cholesterol pill, Crestor, a large study found. The results, reported Sunday at an American Heart Association conference, were hailed as a watershed event in heart disease prevention. Doctors said the study might lead millions of more people, as many as 7 million more in the U.S. alone, to consider taking cholesterol-lowering statin drugs, sold as Crestor, Lipitor, Zocor or in generic form. So what did the study actually prove? 247 of the 8901 people unlucky enough to get stuck with the placebo DIED. Okay, this is good news. Crestor saved the lives of 49 people. Maybe, I am wrong. Maybe we all should be taking Crestor as a preventative. Just look at the following graph. Do you see the difference between the two lines in the chart in the upper right corner. That’s the difference between life and death my friends. What’s that single line on the lower graph mean? That’s not a single line…that’s 2 lines…. In fact, that’s the exact same graph as the upper right graph, except that they used different scales. Now I am mad. Just how stupid do they think I am? According to the researchers, the study volunteers were a group of normal people, just like you and me. We randomly assigned 17,802 apparently healthy men and women with low-density lipoprotein (LDL) cholesterol levels of less than 130 mg per deciliter (3.4 mmol per liter) and high-sensitivity C-reactive protein levels of 2.0 mg per liter or higher to rosuvastatin, 20 mg daily, or placebo and followed them for the occurrence of the combined primary end point of myocardial infarction, stroke, arterial revascularization, hospitalization for unstable angina, or death from cardiovascular causes. Not being a scientist, I was willing to accept that everything was on the up and up. Until I read a critique of this study from Dr. Michael Eades. You can read his post here. Dr. Eades knows his stuff. I would recommend his blog for anyone interested in their health. Let’s look at the sort of fishy aspects of this study. First, the patient population is most unusual. How many subjects are there out there who have both normal LDL-cholesterol levels (defined as 130 mg/dl or below) AND elevated C-reactive protein levels. Especially if you eliminate anyone with any history of inflammatory disorders, which the researchers did. Most people who have an inflammation arising from the metabolic syndrome, obesity or other common inflammatory disorders will have both elevated lipids AND elevated C-reactive protein levels. They are typically found together. The authors of this study had to use 1315 sites in 26 different countries to get the 17,802 subjects involved. Simple division tells us that there were an average of about 13 subjects per center. Not many. Well, these subjects are different from you and me. And what may work for them may not necessarily work for you and me. 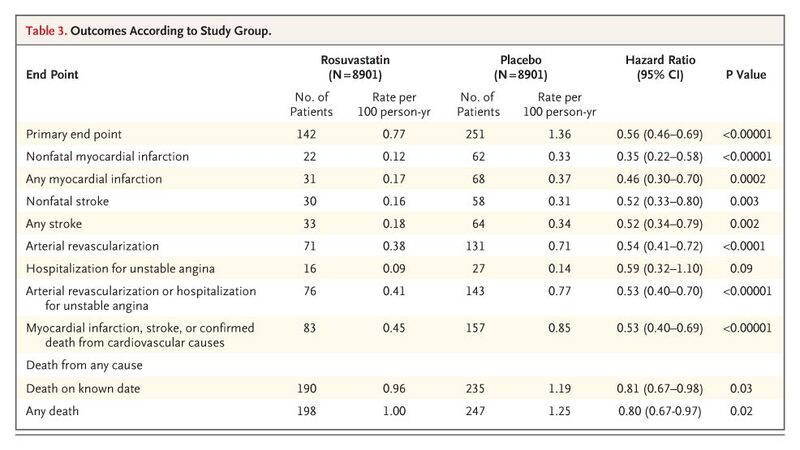 Second, when you look at Table 1 showing the baseline characteristics of the participants, you can see that in virtually all respects the two groups of subjects look identical, which is as it should be in a randomized study. But closer evaluation indicates that there not identical in a couple of parameters. In the category Family history of premature CHD (coronary heart disease) we see that there are 51 more subjects with a family history of premature CHD in the placebo group than in the Crestor group. Since a family history of premature CHD is probably the strongest risk factor for developing premature CHD, do you think a few more of the subjects in the placebo group may have developed it? And maybe died as a result? Third, looking at this same table and checking the very next category, Metabolic syndrome, we find that 71 more patients in the placebo group with metabolic syndrome than we do in the Crestor group. Since the metabolic syndrome is another strong risk factor for development of CHD, do you think some of that difference in deaths could have come from this disparity in the groups? As I say, not conclusive, but fishy. At the time the study was terminated, 75% of the participants were taking their study pills. What happened to the other 25%? What percentage of the deaths came from the 75% taking the pills and the 25% not taking the pills? The placebo group and the Crestor group both reported the same number of side effects. What? 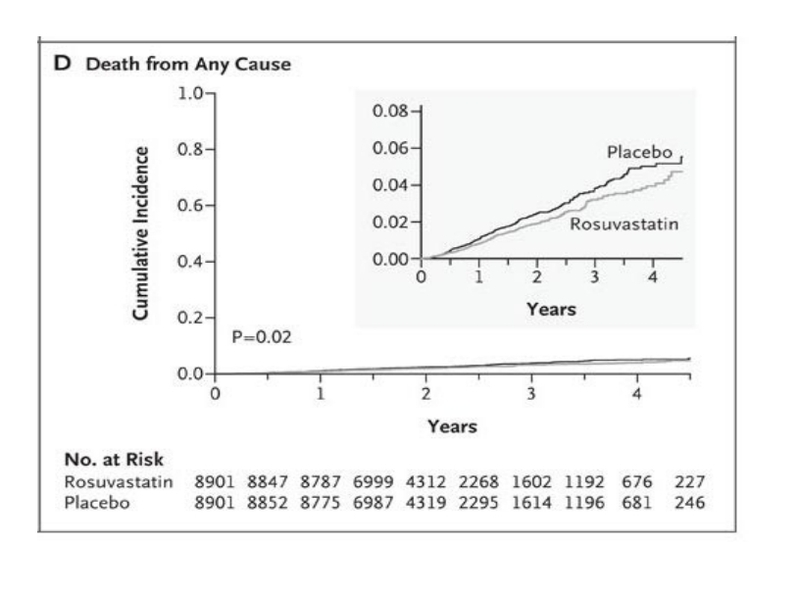 Crestor is a potent statin, known for causing side effects, and the group taking this drug reported no more side effects than those taking the placebo. That’s real fishy. Finally, the fishiest thing of all. They stopped the study right in the middle of it. When studies are done that might put people at risk by giving them potentially dangerous drugs, it is typical for an outside group to take a peek at the data at certain milestones to make sure the study medication isn’t killing people. When this data is evaluated, and it is found that subjects on the experimental medicine are dying at unacceptably high rates, the study is often halted. I’ve never seen a study halted because the placebo group was dying at higher rates. That really makes me wonder. If we look at the data and ignore the spin, this study shows us that people with low-density lipoprotein (LDL) cholesterol levels of less than 130 mg per deciliter (3.4 mmol per liter) and high-sensitivity C-reactive protein levels of 2.0 mg per liter or higher should see a slight decrease in mortality by taking Crestor. Personally, I am sticking with a healthy diet of animal protein, fruits, and vegetables, and supplementing with a quality multi-vitamin/mineral, fish oils and Vitamin D come winter time. Sometimes I’m really happy that Canada does not have pharma advertising. Beagle, are you saying Canada doesn’t allow drug companies to advertise? That sounds fantastic! Very well written, as usual, DR.
All these news sources get the same press release, and very few dig any deeper. Maybe that’s why newspaper readership is falling. Your blog does a better job of reporting on this than most of to so-called professionals. Great info. I think I’ll stick to the same healthy diet as you! Only two countries allow such advertising, New Zealand and the United States. However, three major consultations on the possibility of introducing DTCA have been held in Canada since 1996. In addition, Canadian exposure to prescription drug advertising in US media has grown enormously since 1997, when a shift in US regulatory policy facilitated the broadcast of such ads. The pharmaceutical industry spent more than $4 billion on DTCA in the US in 2004. No risk information is required. In the US, reminder ads are prohibited for products with “black box” warnings of serious risks on their label. • Disease-oriented or help-seeking ads: these do not mention a specific brand but discuss a condition and suggest consumers ask their doctor about an unspecified treatment. I don’t have anything against DTCA. It’s freedom of speech, which is highly valued in the U.S. and across the blogosphere. I assume Canadians have socialized medicine. It will be interesting to see if Canadian doctors will be able to prescribe Crestor for healthy adults with normal cholesterol levels but elevated C-reactive protein, as in the study at hand. I tend to doubt it, unless Big Pharma has undue influence with Canadian policy-makers. If I want to spend $2,500 (US) every two years on a pill that has a less than a 1% chance of preventing my stroke, heart attack, or death over two years, that’s my business. But I’m not going to ask my fellow citizens or anyone else to pay for it. By the way, I wouldn’t spend it. I would focus on healthy lifestyle choices and the Mediterranean diet. We have to pay for our drugs in Canada. But our doctors receive the same pharmaceutical training as yours – their drug reps. So I definitely see a time when our docs will prescribe Cresor or Lipitor or whatever-Tor as a preventative. I have a new client whom I sent to his doc because I suspected high blood pressure. When the doc told him he had high bp, the prescription pad came out and he left with a script for a beta blocker. No drug can do what good nutrition can. I couldn’t find your email on your site. I put this post of yours on my Ellsworth American blog with a link to you. I don’t usually do this but thought this was a great counter balance to what we are being fed. Is this OK with you? And, I also added you to my blog roll. Could you send me a link to the Ellsworth American blog? I am flattered that you thought it was that good. Re: my email…I have a link on my about page, but based on your comment, I added a text widget.